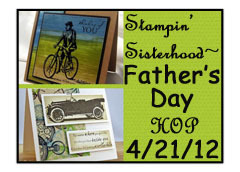 Welcome to the Stampin' Sisterhood's Father's Day blog hop! I'm glad you are able to join us because the design team has some pretty cool Father's Day cards to show you. Please note that Blogger has been causing problems for some of our designers all week long so you may come across a few blogs that do not appear updated with today's blog hop post. If that happens, please refer to the hop order at the end of my post or on The Stampin' Sisterhood Blog to continue. However, make sure you plan to check back on the other blogs because you'll need to leave a comment on each blog in order to win our BIG PRIZE! Also, before I move onto my card, I would like to remind you that the Stampin' Sisterhood has a very active blog with daily postings by the design team members, Sisterhood Sunday challenges that we'd love to have you participate in, as well as a monthly blog hop! Also, watch out for something NEW coming your way next month! If you complete the entire blog hop route, leaving a comment at every blog, as well as the Stampin' Sisterhood blog where you let us know that you have hopped the entire route, you will be eligible to win a Rubbernecker stamp set of your choice!!! The winner will be announced on our Stampin' Sisterhood blog on April 28!! Oh, and another thing....as a BONUS ENTRY, we will draw an EXTRA winner for a stamp set of your choice just for sharing our hop on your Facebook page or blog!! Just be sure to include that in your comment on the Stampin' Sisterhood blog. I really have to get that stamp! Thought I ordered it but I didn't. Love the way you colored him! You background and hook are over the top FABULOUS! Absolutely amazing coloring -- wow!! This is really spot on fabulous, Charlene!! Love coming to your blog and seeing my M&M card and your bear! I have the card on a shelf in my stamp room and see it every day! I love how you have colored and distressed up this wonderful image Charlene! A super Father's Day card! Amazing coloring, Charlene!!! Stunning card. Charlene, this is really fabulous. I love your design and the coloring is great. It should be framed and hung on a wall. The lure is such a wonderful touch. What a perfect masculine card this is,Charlene. Your coloring is wonderful and I love the background pape you used. Wonderful masculine card and great coloring! Charlene, this is fabulous! Wow! Your coloring is amazing! Beautifully done masculine creation! Great FD card, love Grampa and the flyhook, TFS! Fabulous! I love the burlap backgroundm and the old tile look of the main panel. "Grampa" actually looks a good bit like my Dad did! And, yes. He loved to fish! a fabulous card with a wonderful colouring! Great coloring! Love the image! What an awesome coloring job!!! Rubbernecker has some wonderful nostalgic stamps including this ol' Grandpa. Love its distressed look and the fly screams "GUY CARD!" love your great design and this fabulous image, so great. that is a wonderful man card! They are sooo hard to make and yours is amazing. Great card! Love the image!! Your coloring is fabulous on Gramps, Charlene...you did an awesome job on this!!!! I can't believe I don't have that stamp...gotta fix that!!! Love your card. Reminds me of my grandfather. Great card. Wonderful coloring and love the little fish hook!! This is a gorgeous card, Charlene! I love the warm colors, and your watercoloring is spot on! Perfect in every way, I say! What a great masculine card. I love how you distressed the paper to go with the stamped image. I like how you painted the image. I just adore this, Charlene! The painting is wonderful and the background is perfect! Super job! Your card is fantastic! I love everything about it especially your amazing coloring of the image and how you crumpled and distressed the background. WOW! Great image--I like your coloring and distressing and the fishing fly is the perfect embellishment. Love the image on this card. Absolutely awesome, Charlene!! I love this remarkable Father's Day design! Oh my...this image is awesome! It just reminds me of the old Norman Rockwell prints! Wow, Charlene...you did a wonderful job with your watercolor and distressing...I love the shadowing you created! !